GRRM: A RRetrospective, my massive half-million word collection from Subterranean Press, has been nominated for the World Fantasy Award as Best Collection of 2003. GRRM will be competing for the award with collections by Elizabeth Hand, Jack Cady, Glen Hirshberg, and Michael Marshall Smith. Two of the five finalists were nominated by the members of the convention, the other three by this year’s WFA jury. The five-person jury will determine the winner, to be announced at this year’s World Fantasy Convention, to be held in Tempe, Arizona over Halloween weekend, October 28-31, 2004. A full list of all of this year’s WFA nominees can be found on the convention website at http://www.worldfantasy2004.org/wfcawards.html. The World Fantasy Award — sometimes called the Lovecraft Award, or the “Howie,” since the trophy is a wonderfully gloomy and cadaverous Gahan Wilson bust of H.P. Lovecraft — is among the premiere honors for any writer of fantasy or horror. I’ve won the Howard once before (for my werewolf novella, “The Skin Trade,” back in the 80s), and lost it four times (for my novels Fevre Dream, The Armageddon Rag, and A Game of Thrones, and my novella “The Hedge Knight”), but as they say, “it’s an honor just to be nominated.” I am very proud of the RRetrospective and the beautiful edition that Bill Schaefer of Subterranean produced, and pleased by this recognition. 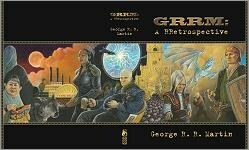 And in related news, I should mention that the trade hardcover edition of GRRM is once more available from the publisher and can be ordered from Subterranean’s website at http://www.subterraneanpress.com/ . The trade had previously sold out, but one large order to a bookstore chair apparently fell through, so their copies have been released again for general purchase. If you missed the chance to pick up the book last fall, here’s another opportunity — though the books now on hand will not last long, in all likelihood.